I was challenged by Knorr to come up with a creative recipe using their Knorr Flavour Pots which have just won Product of the Year. You may have seen my Butternut Chicken Thai-Style which used the Ginger and Lemongrass Flavour Pot and the Garlic Flavour Pot and the Lentil and Vegetable Soup which used the Garden Herbs Flavour Pot. Knorr Flavour Pots have just collected first prize in the Sauce and Seasoning category for this year’s Product of the Year awards. Knorr Flavour Pots allow you to easily infuse your cooking with the flavour of fresh herbs and spices but with the handy convenience of dried. The range features nine different tantalising flavours, including Mixed Herbs, Three Peppercorn, Curry, Garlic, Mixed Chillies, Garden Herbs, Ginger & Lemongrass, Paprika, and Mexican. 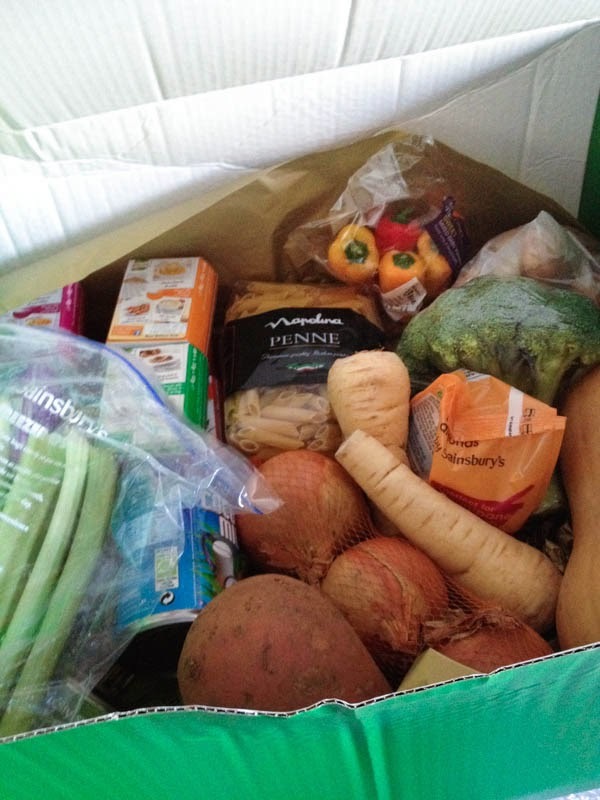 In order to inspire some creative recipes Knorr sent me a box full of vegetables, tins and packets. Amongst the vegetables was a nice big sweet potato, you can see it at the front, it nearly went into the chicken dish, but then I suddenly thought that it would be interesting to see if the Ginger and Lemongrass Flavour Pot would work in a sweet potato muffin, I got quite excited by the idea. The ingredients of the Ginger and Lemongrass Flavour Pot are water, ginger spirit vinegar, glucose syrup, green pepper, salt, palm oil, garlic, sugar, basil, citrus fibre, cayenne pepper, coriander leaves, cardamom, onion powder, Kaffir lime leaves, aniseed, gelling agent (xanthan gum), natural lemongrass flavouring, natural chili flavouring. A few things in there that wouldn't normally be in a sweet muffin, but I thought I'd have a go anyway. 1.Preheat the oven to 200C, grease a muffin tin or line with papers. 2. In a medium bowl combine the plain flour, wholemeal flower, baking powder and bicarbonate of soda, cinnamon, nutmeg and allspice. 3. In a large bowl mash sweet potatoes. Add brown sugar, eggs, orange juice carrot and the contents of the Ginger and Lemongrass Flavour Pot, mix together until well blended. 4. Add flour mixture to the wet ingredients, stirring until just combined and blended, don't over mix. 5. Spoon the mixture into the prepared muffin tin, filling the cups to the top. Bake in the preheated oven for 15-20 minutes or until golden brown. You can leave the muffins plain or make a water icing with icing sugar and lemon juice and drizzle over the top. 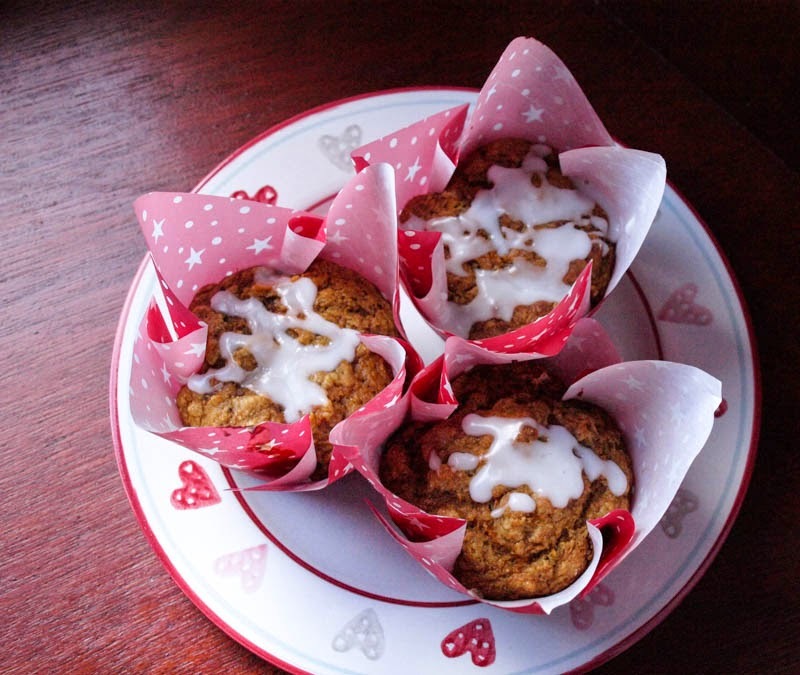 The Sweet Potato, Ginger and Lemongrass Muffins were absolutely delicious and, unlike many muffins, they actually got better the next day! There was no hint of savoury flavour and the flavours of lemongrass and ginger came through really well and the sweet potato kept them really moist and moreish. I didn't intend for them to Valentine's Day Muffins, but they would make a very fine treat for anyone who likes a touch of spice. 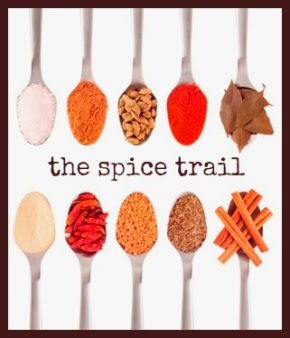 Over at Bangers and Mash Towers, Vanesther is sitting in the Temple, well sort of, she is looking for entries to The Spice Trail that fit the bill of 'Temple Food', spicy foods that are good for you, but also comforting. 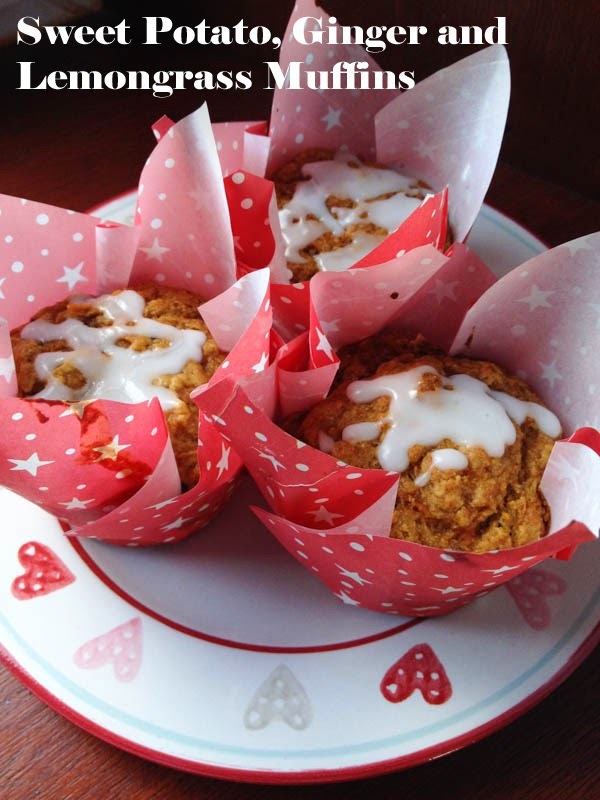 I think these Sweet Potato, Ginger and Lemongrass Muffins definitely qualify as Temple Food. This is inspired! I'd never have thought to use the flavour pots for this; in fact, I've never used flavour pots at all so I really must get some. The muffins look delicious! How on Earth did you think up this recipe?! So inventive! Wow fantastic flavours Janice! And beautifully presented for Valentine's Day. Thank you for entering into Treat Petite! Awesome flavour combo Janice. I want two or three of these. Thanks Kevin, I was so pleased that they worked so well. I don't know, I just wanted to make something different and the ingredients led me to these muffins! Thanks Karen, the cases are discount store bargains! Thank you, I still have some in the freezer, Bintu. Might break them out this weekend. What a clever idea, I bet they are tasty! I've never tried those flavour pots, but would certainly never have thought to do this with them! Did they taste sweet or savoury? They tasted best when they were cold, really no savoury taste at all. Thanks Charlene and thanks for the comment on my photographs, so difficult at this time of year there is so little light. They look so tasty - I almost didn't know what to expect when I saw the recipe header but I am super intrigued by the sound of them! I do love the wrappers too, fab pattern and colour! They look adorable Janice, love those muffin papers. You would expect the garlic flavour to come through, but I'm glad it didn't. The ginger and lemongrass sounds delicious as does sweet potato. Nice box of goodies too. What a great combination of flavours. Yum! Janice, these sound scrummy, and they're so pretty as well! Great mix of flavours Janice. I haven't made any muffins in soooooo long. Thanks Anne, they surprised me too! I know, I wondered about the garlic, but it didn't seem to come through. it was hard to pin down the flavours although the Lemongrass was definitely to the fore. Thanks Jean, I love these kinds of papers, somehow make the muffins look more professional than the usual pleated cups. Thanks Camilla, glad you liked them. Thanks Jac. Muffins are so quick and easy to make, I love them. That's a really clever idea Janice, don't think I would have thought of it at all! I've never used the flavour pots before, will have to give them a go. 3 Super Creative Sandwiches and a Pizzette!